petition: When South Africa's Iconic Wildlife Is Gone It Will Be Too Late!! Ban Trophy Hunting NOW! When South Africa's Iconic Wildlife Is Gone It Will Be Too Late!! Ban Trophy Hunting NOW! WHAT IS TROPHY HUNTING? Trophy hunting is a specific type of hunting where a portion of the animal is kept as a souvenir to memorialize the experience. It is not illegal, as poaching is, but there is certainly a debate that surrounds the practice. When photos surfaced of Melissa Bachman posing with a Lion she killed, the outrage was immense (for perhaps more complex reasons than solely hunting). In a story on this topic, OGP's Kristina Pepelko said, "The backlash to her photo is certainly warranted as big game hunting is a poor excuse for conservation, especially when 75 percent of wild Lions have been killed in the last 20 years, and this number is likely to accelerate in the next decade if nothing is done, as reported by ABC News." While most of the world worries about the long-term survival of Africa's threatened Lions, a U.S. trophy hunter killed the most famous Lion of all in what turned out to be an illegal hunt in Zimbabwe. Then no sooner had protests died down than news reports told of a German trophy hunter who followed up and killed the largest bull Elephant in Africa in 30 years — perhaps the largest ever seen in Zimbabwe — and never mind that poachers are driving the continent's Elephants to the brink of extinction. What can one do, except feel powerless and fume and wonder what is wrong with some people? And find another dentist besides Walter Palmer in Minneapolis? Palmer, of course, wounded Cecil, leaving him to suffer in death throes for 40 hours before killing him with a rifle shot. The world is seeing trophy hunting in its true light: as a senseless pastime for a very few callous people, a tiny fraction of the one-percenters, who travel the world, killing as much and as often as they can. 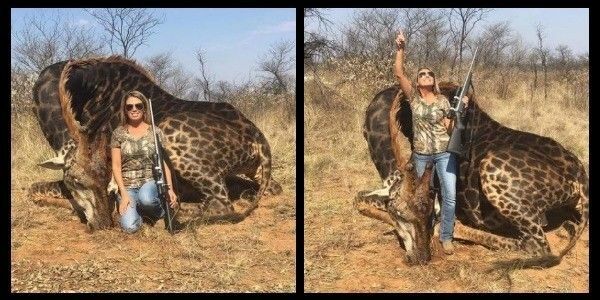 Tessa Thompson Talley, an American trophy hunter, killed the giraffe in South Africa and, as is common with big game hunters, posed with the carcass of the giraffe for a photograph. She then posted the image to Facebook with the caption: "Prayers for my once in a lifetime Dream hunt came true today! Not only are these actions senseless, but ecologically reckless. Animals whose survival prospects are in doubt do not need the arrows and bullets of trophy hunters to hasten things along. Cecil was the star attraction of Zimbabwe's Hwange National Park where he lived with his family — a pride of female Lions and their cubs. With his black mane and awe-inspiring regal countenance, the sight of him thrilled thousands of visitors. His death was "enjoyed" by only one person. Are these animals worth more to local economies alive or dead? One African conservationist estimated that eco-tourists from just one lodge paid more in a week to take pictures of Cecil than the $55,000 that Palmer spent to put the Lion's head on his trophy wall. Over his lifetime, a living Cecil could have brought in $1 milLion in tourism. Killing animals in the name of conservation is surprisingly something that many groups have claimed. The Dallas Safari Club is proposing to auction off a "special permit" from the government of Namibia to hunt one of Namibia's 1,800 remaining black rhinos. All in the name of conservation. While trophy hunting often brings in money to certain parks or locations, it's counterproductive to the overall idea of conservation. Why shoot something you supposedly want to protect? FIVE REASONS WHY TROPHY HUNTING SHOULD BE BANNED! 1. Trophy hunting can hurt the overall population of a species. Though hunting groups often claim that a small amount of controlled trophy hunting does not harm populations, the opposite appears to be true. In the case of African Lions, "Approximately 600 Lions are killed every year on trophy hunts, including Lions in populations that are already declining from other threats. The adult male Lion is the most sought-after trophy by wealthy foreign hunters. And when an adult male Lion is killed, the destabilization of that Lion's pride can lead to more Lion deaths as outside males compete to take over the pride," reports Jeff Flocken for National Geographic. The recent Michigan wolf hunt has been filled with controversy – wolves were recently removed from the endangered species list, and soon after, hunted for trophies. The Toledo Blade reports, "People who understand conservation were appalled [about the hunt]. Michigan Technological University Professor John Vucetich, a conservation biologist, said, 'There is no scientific evidence wolves need to be hunted.' He added: 'It's not common sense to spend decades bringing the wolf back from the brink of extinction, only to begin killing the animal.'" It seems that there would be less destructive ways to conserve a species, specifically, one that doesn't involve putting a price on their head. 2. Does it really bring in money to help the animals and local communities? A study on the economic benefit behind Lion hunting in Africa concluded, "The suggestion that trophy hunting plays a significant role in African economic development is misguided…Revenues constitute only a fraction of a percent of GDP and almost none of that ever reaches rural communities." Dr. Naomi Rose agrees as stated on the HSUS blog, "Regarding the statement that trophy hunters do a lot for conservation, it's true that some portion of some hunters' fees goes to conservation in some countries, but it's rarely the major source of conservation funding. Usually middlemen—commercial outfitters—take the Lion's share of sport hunting proceeds and local communities and conservation and management agencies get the dregs." 3. Trophy hunting is elitist Since trophy hunting for "big game" usually takes place in more remote locations in which people need to fly into, or charter transportation, it's not really an activity that's open to anyone. Not that having it open to more people would make it any better, but trophy hunting tends to be richer people going out for the thrill of the chase – under the guise of conservation. For example, the Trump brothers came under fire after photographs of them with animals they had killed in Africa surfaced. Mother Nature News reported that there are many other ways the brothers could have helped the people of Zimbabwe, rather than hunting and killing animals. True conservation activities should involve the local community in a way that is sustainable, and trophy hunting does not accomplish this ideal. 4. Trophy hunting can be linked to poaching If trophy hunting were to ever hope to be known as "conservation," there would have to be extremely close monitoring by scientific and state bodies regarding the health and legality of the hunt. While a certain amount of regulation does take place, it is not enough to prevent the possibility of trophy hunts being used as cover for poaching. According to a report "The Myth of Trophy Hunting" by Save African Animals, "Opening up even a limited legal trade creates a smokescreen for poachers which is almost impossible to police. Prior to 1986, when the whaling moratorium was introduced, legal quotas were widely used as cover for poaching, driving some species near to extinction. The same is happening with trophy hunting of endangered species." The hunting of animals for trophies, especially large game animals, can lead to a slippery slope in which the animals are the victims. The report also includes more information on the many issues behind trophy hunting. 5. Financial incentives can hurt the population of a species Monitoring the population of a species takes a lot of resources for conservation groups and governments. It is possible that misinformation can lead to incorrect reporting of numbers to encourage hunting, or the financial benefits of continued hunting lead groups to inflate their reported numbers. Dr. Naomi Rose, a marine mammal biologist, explains "…Sport hunters' fees put economic pressure on managers to inflate hunting quotas beyond sustainable levels. Despite what science and common sense said, the quotas were increased and the [population of] bears declined." It's OFFICIAL! #Giraffes are now on the #redlist of endangerment due to a 40% decline over the last 25 years yet trophy hunters still slaughter ENDANGERED animals! Tess Thompson Talley killed a rare Giraffe then posted an image with the caption: "Prayers for my once in a lifetime Dream hunt came true today! Spotted this rare black giraffe bull and stalked him for quite awhile. I knew it was the one. He was over 18 years old". Please Re-Share the petition to continue to raise awareness to the petition. Paul at Protect All Wildlife. Please re-share the petition far and wide and help end trophy hunting. What an AMAZING achievement - the petition has reached over 100,000 signatures in only a short while. Can I ask that you all share again on Twitter and Facebook please. Let's make this the BIGGEST anti-trophy hunting petition EVER! !